The beauty of polished and stained concrete is absolutely comparable to fine marble, hand made ceramic tile, granite, terrazzo... it is limitless in what it can be stained to look like. Patterns can be applied to the concrete to create tile lines, curves, artwork, logos seams as in marble, or anything you can think of. 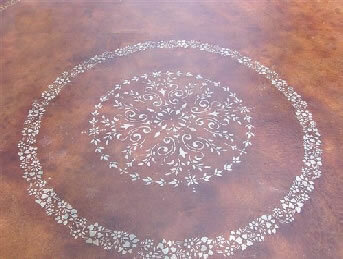 These patterns can be creatively stained into the design as well as cut into the surface of the concrete. Inlays can be cut into existing concrete. With the use of glass, stones, and metals which can be polished to a shine a unique piece of artwork can be installed right into your floor. The results of this can be fantastically artistic. Glass, stones, and other polishable materials can be scattered into the concrete at the time of pouring which when polished creates a wonderful natural and if desired colorful effect.